This article will describe how to connect your Act-On account to Interact apps. Step 1: In the Interact app builder left sidebar, under Connect your email list, choose Act-On from the list of integrations. 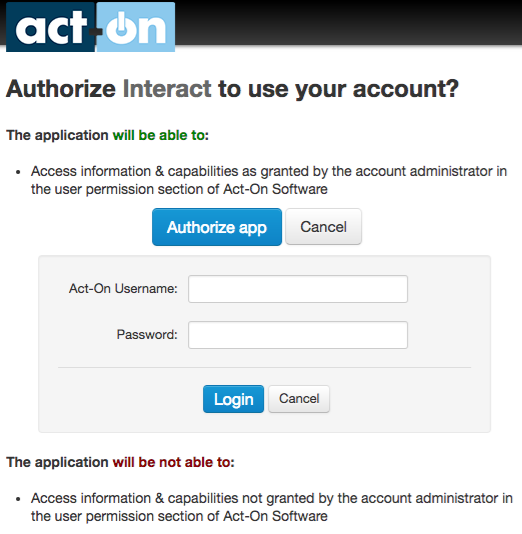 Step 2: You will be prompted to authorize the Interact app to access your Act-On data. Please click Authorize app, enter your Act-On credentials and click Login. Add to Contact List **Required**: You must select one contact list for all of the available Interact triggers. Choose an Act-On contact list from the dropdown to add new contacts to a specific Act-On contact list. Example: For a quiz result trigger, you could connect different results to different contact lists to send autoresponders specific to the quiz result your customers received. Update Contact List Column: Choose an Act-On contact field from the dropdown to update the contact field for new contacts with a specific value. The value will auto-populate with the trigger name, but you can customize this with any value you want. Example: For a quiz result trigger, you could choose the Act-On contact field "Quiz Result Title" from the dropdown and populate the field with the quiz result title for your quiz. Step 2: For all other fields, choose one contact field from the dropdown that you would like to populate with the form value. Example: mapping Company Name to "Custom Field 1" will populate the value inputted for Company Name into the Act-On contact field "Custom Field 1". Will existing Act-On contacts be updated? Yes, existing Act-On contacts will be updated with updated field values and be added to new lists. How do you create new Act-On contact list columns? Step 1: In your Act-On account, navigate to the list where you want to add contact list columns. Step 2: Click More Actions in the top right and choose Change List Columns from the dropdown. Step 3: Click Add Column at the bottom of the page. Step 4: Enter a value for the name of the list column and click Submit. Step 5: Click Save at the top of the page to save all changes. What will a new contact look like in Act-On?